I'm a sucker for bar food. Admit it, who is not? My favorite menu item is the loaded potato skins. Problem is, I cannot eat them safely as a celiac. Turns out they deep fry them before stuffing them with cheese and bacon before broiling and topping with sour cream and scallions. Wow, it's probably a good think I can't eat them - far from the healthiest menu choice. At the same token, I never considered making a homemade version of potato skins, since scooping out the baked potato seemed like a waste. 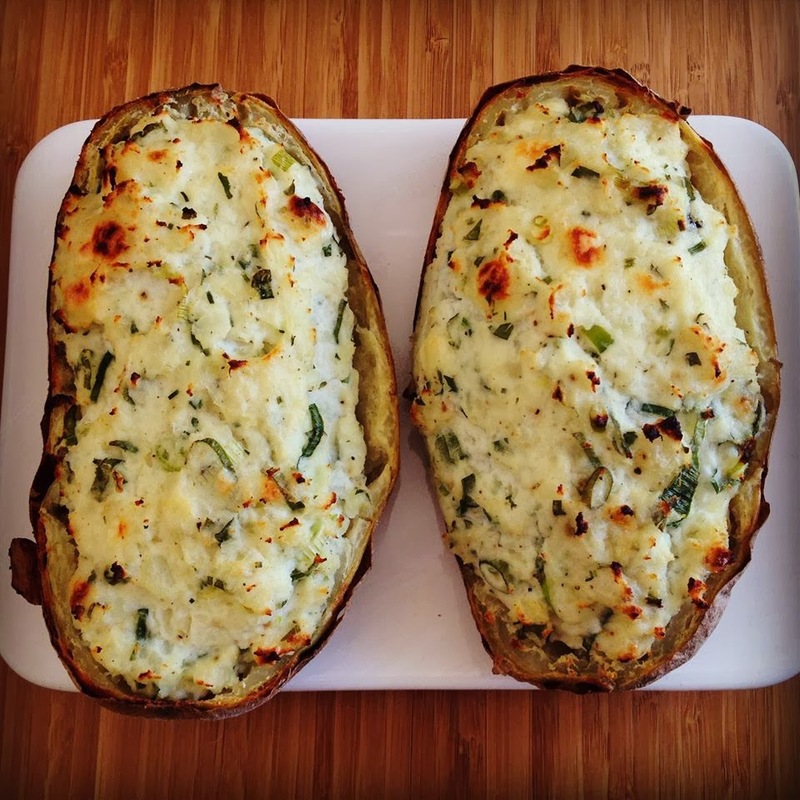 Another favorite unhealthy potato recipe of mine is twice baked potatoes. The portion alone is twice too big. Ah, I know, split them in half, stuff with tasty healthier options and bake until crispy. The ultimate potato mash-up: a twice baked potato skin. This version I stuffed with some of my tasty favorites: Gorgonzola cheese crumbles (a blue cheese), Greek yogurt, scallions, parsley, chives, olive oil, garlic salt, and black pepper. Get creative and try with your favorite flavor saturated ingredients like Parmesan, nutritional yeast, anchovies, sundried tomatoes.... you get it. Flavors usually too strong on their own make great fillers without feeling the need for super fatty unhealthy ingredient choices. This recipe is for 2 generous servings using 1 russet potato. Scale up according. Note on type of potatoes: russet/Idaho is the only wise choice. No other type will work as well. Preheat oven (toaster oven is perfect for this) to 375F. Wash the potato well. While it is still wet, generously sprinkle the whole surface of the potato with salt. This will make the skin extra crispy. Bake for about 45 minutes until crispy on the outside and fork tender, or it gives easily when squeezed. Allow to cool just until you can handle it safely using a clean hot pad. Cut the potato in half lengthwise. Using a fork, carefully scrap out the insides into a mixing bowl. Try to keep away from the skin. Leave about a quarter of an inch lining for the skin. Place the hollowed out skins on a foil lined mini cooking sheet. In the bowl with the potato "meat", mix in the cheese, yogurt, scallions, herbs, seasonings. Mix well. Taste. Adjust seasonings accordingly. Split the filling in half, and fill the potato skins. Put back in oven and bake until it starts browning, about 15 minutes.